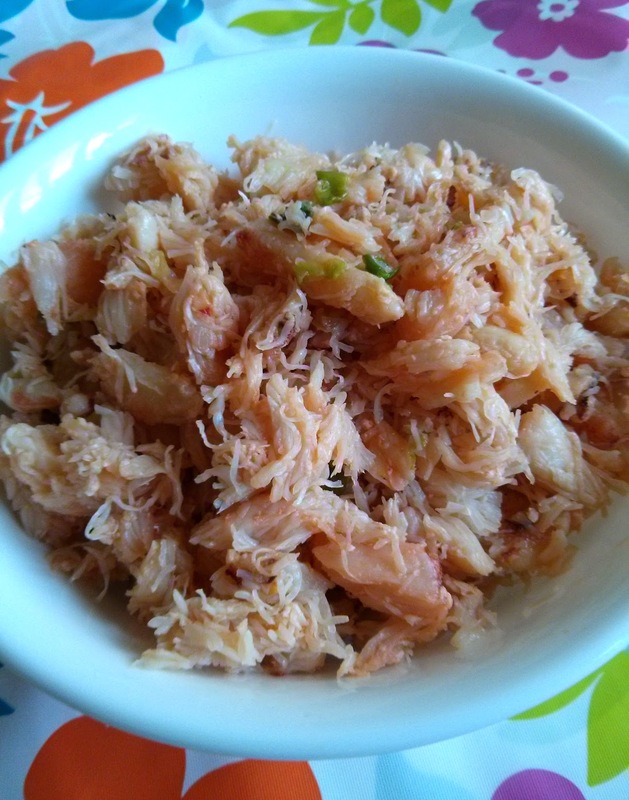 When I visited my parents recently my mother gave me some fresh Maine crab meat that she hand-picked. She mentioned the last time she purchased live crabs was 10-gallons and it took her 2 days to picked out the meat! If you have never removed meat from a crab before I recommend you try just a few to start and see how far you get. She already sauteed the meat with a little oil, garlic, scallions and salt in order for it to have longer shelf life and specifically told me to use it for a quick banh mi (Vietnamese sandwiches). However, I have almost 2 pounds of broccoli that I had washed and prepared in my refrigerator and needed to use up before they turn yellow. We had our first snow (flurry) yesterday here in Seacoast New Hampshire and the weather is getting quite chilly, so hot soup is on my mind. My parents on the other hand live in the middle of Maine and got over a foot of snow! I know the last few postings have been on soups. Just to be clear, many of my blog postings are not on real time. 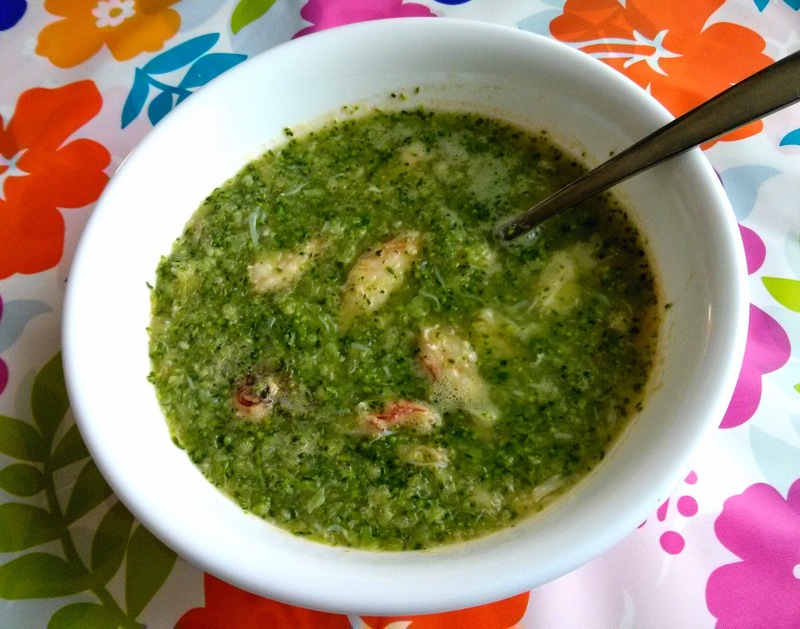 This soup is inspired by cream of broccoli but without the cream. Although my husband tells me it turns out very tasty, I would not recommend making this for a dinner party... unless they are your closest friends or family! The broccoli bits can get in between your teeth. 1) Add oil to a heated pan. Once the pan is hot add scallion and garlic. Saute about 30 seconds to a minute. 2) Add crab meat and salt or fish sauce (if interested), saute gently for about 1-2 minutes. *This Sauteed Maine Crab Meat has many uses. It is a great filling for delicious whole banh mi or as mini banh mi appetizers. You can also put a little on sliced cucumber, crackers or banh phong tom (shrimp chips) for other tasty appetizers. 1) Boil water or broth in a medium to large pot, blanch broccoli stalks for about 3-4 minutes then scoop them out and set aside. Add broccoli crowns and blanch for about 1 minute then scoop them out and set aside. 2) Remove pot from heat and let water or broth cool. 3) Heat a small pan over medium high heat. Add oil once the pan is hot. Saute onion and garlic for about 2 minutes and set aside. 4) In a blender add 1/2 of blanched broccoli, 1/2 sauteed onion/garlic, and 1/2 cooled water or broth. Puree this until well blended. Repeat for the other half of broccoli, onion/garlic and water or broth. 5) Use the same pot (for blanching broccoli) and pour the blended mixture into it. 6) Heat the pot over medium high heat and add Sauteed Maine Crab Meat (see above) and fish sauce. Avoid letting the contents boil. Once everything is heated thoroughly turn off heat. Add freshly ground pepper to individual bowl if interested. *I prepared my broccoli crowns and stalks by cutting the stalk off each crown. I peel the outer layer of each stalk since this layer is tough. I also peel the outer layer at the base of each crown. I store them in a plastic bag and refrigerated. When ready to use I take them out and wash a few times. Sometimes when I am busy I prepared broccoli and other vegetables ahead to save time later. *If you want to make this creamy without adding dairy add 1-2 cups of coconut milk to step 6. *There are many great advantages to living near the coast in the Northeast. One is over time you get to establish a good relationship with some very hard working fishermen who still go out for their catch so we can have access to the wonderful fresh seafood! My mother worked with some of them (when she was working for the paper mill in Bucksport). This is their hobby and also something to bring home extra income.